Without Medjugorje I would never have played " The Passion of Christ"
Jim Caviezel played the main role in Mel Gibson's movie "The Passion of Christ", and became known throughout the whole world. The very moving presentation of the scourging and crucifixion of Jesus have permitted the passion of the Lord to become the initiator of many discussions about faith. A Viennese professor of Theology brought the criticism of the movie to the point: " How can I accept that my sins are supposedly so great, that a man must bear so much suffering for me? " Again and again we hear about conversions, which the spectators experienced while watching the movie. 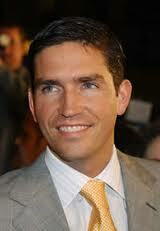 Who is this Jim Caviezel who was able to interpret Jesus in such an impressive way? In an Interview with the" Oase des Friedens " he admits that without his experience in Medjugorje he would never have accepted this role. In Medjugorje he was granted a new dimension of faith. My wife was in Medjugorje while I was in Ireland during the filming of "Monte Christo".Things were not going so well at the time, although I was working 7 days a week. She called me and at the tone of her voice I could feel that she had undergone a change. She began telling me about Medjugorje and that a visionary would come to Ireland. I interrupted her with these words: look, I have serious work to do. I cannot deal with visionaries just now. I thought that as a catholic I was not obliged to accept Fatima, Lourdes or Medjugorje at all costs. This was my thinking. I also remembered how my friends and I, who were going to a catholic school at the time, were enthusiastic about the events in Medjugorje, and as we heard that the local Bishop rejected the apparitions, declaring them not authentic, we had lost interest. Today I am aware that only God could know me so well as to know where I could be seized. As strange as it sounds, I was given free time again on the following Sunday and could meet the visionary Ivan, which had been the special desire of my wife. During the apparition I knelt next to him saying in my heart:" ok, here I am. I am ready. Do with me as you wish." At the same moment I felt something filling me. It was so simple and yet so unique. When I got up, tears were streaming out of my eyes. Ivan told me:" Jim, man always finds time for what he loves. If somebody has no time, and suddenly meets a girl whom he loves, he will make sure he finds time for her. The reason why somebody has no time for God is that he does not love him." This touched me and I wondered whether I had time for God. Ivan continued to say to me: " God calls you to pray with the heart." " How should I do that?" I asked him. " By beginning to pray." In that moment a window in my heart opened. Never before did I think this was possible. We went to a restaurant, and I must say that the food and wine that evening tasted as good as never before. Something began changing in me. Often my wife had wanted to teach me how to pray the rosary, and I had always refused. Now I wished to pray the rosary although I did not really know how to. I only felt that my heart had opened for it. One morning I said to my driver who was bringing me to the filming site every day: "I do not know what you think about this, but I wish to pray the rosary." To my surprise he told me: " O.K. let's do that." After the end of the filming, which finished in Malta, I decided to go to Medjugorje. I was full of inner expectations. When I was 20 years old, there was like an inner voice that told me to become an actor. When I told my father about that, he gave me this answer: "When God wants something from you, then surely only for you to be a priest. Why should you become an actor?" Medjugorje reminded me of Bethlehem and I thought:" as Jesus was born in a small place, so the Mother of God appears here in a poor area between the hills." In the beginning I was still surprised how much the people were praying here. I saw a similarity with a Basketball -camp, thinking that there you do not only play once a day, but again and again, continuously. After all, in school, we do not read just once a day, but all the time, again and again. "Look, if you do not believe in radiation, go to Tschernobyl and stay there for 5 days. You will see that your hair starts falling out. These are the consequences of radioactive radiation. In Medjugorje there is a radiation from heaven, in which thousands of people convert and Generations of sinners melt. It is an irradiation of the Holy Spirit which leads people to prayer, daily Holy Mass and to Adoration of the Blessed Sacrament. This experience lasts, also at home. In my family we live the Sacraments together. With my children I pray the rosary every day on the way to school. If I do not start at once, my son begins to pray. I went up to him, he put his hand on my shoulder, which I also did to him. He laid his hands on my head, which I also did to him. In that moment I felt these words in my heart: "I love you brother. This man loves Jesus." Father Jozo spontaneously turned to his interpreter, asked her in Croatian who I was and that he wished to speak to me. At that time, I had just completed the filming of the "Passion of Christ" and repeatedly had the experience how different powers tried to keep me from doing that movie. Probably you know the saying" crossing the Rubicon" - it means that there is no turning back. The film "The Passion of Christ "is something like that for me. When I heard Pope John Paul II say that we need not be afraid, I thought that I was without fear in any case, and that I was doing well. During the filming of the "The Passion of Christ" I began to understand that Jesus is more controversial than ever before. Some colleagues prophesied me that I would loose everything through that film, my carrier, my money, perhaps my family or my life. I was 33 years old when the work for the film began; I was the same age as Jesus when He lived the Passion. Repeatedly I doubted whether I was worthy to interpret Jesus. Ivan Dragicevic encouraged me telling me that God doesn't always choose the best, and that he saw that with himself. Temptations came again and again, and I had to fight them. In that warfare I often experienced a great inner Peace. For example, in the scene where Mary, the mother of God comes running towards me and I say:" Look, I make all things new." We repeated this scene four times, and still I felt that I was in the first place. Somebody then hit the cross and my left shoulder jumped out of its joint. 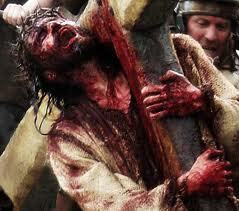 By this terrible pain I lost balance and was crushed to the ground by the cross. I fell onto the dusty ground with my face, and blood shot out of my nose and mouth. I repeated the words to the mother:" Look, I make all things new." My shoulder was hurting terribly while I slowly embraced the cross and felt how precious it is. At that point I had stopped acting and Jesus became visible. As if answering my prayers he came out:" I wish that people see you, Jesus, and not my acting." As the rosary was constantly prayed,- I don't know how many rosaries I prayed during the film- a special atmosphere was created. I knew that I was not to use swear words or let myself go, if I wanted to transmit something to the team. Most of them did not know Medjugorje, they were great actors, and we were happy to have them. How else could I transmit Medjugorje to them if not by my life? 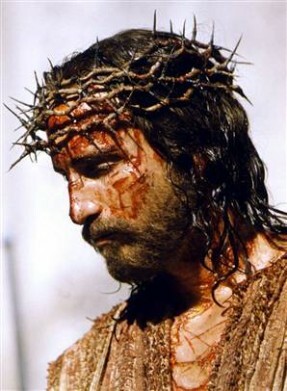 I know that "The Passion of Christ" is one great film of Love.